Who's Afraid Of A Ginger Beard? This morning I was feeling contemplative, pensive and ponderous. My thoughts turned to my beard and I wondered idly if perhaps I should go clean shaven for a bit. Fortunately support for the beard rattled in. A subsequently mentioned internet oddity involving a woman who knits beards led me back to the wonder that is Beard Revue where I soon found myself with a t-shirt purchase conundrum that could not be solved simply by crowdsourcing an opinion from twitter, so I figured I should test the polling plugin I just got for the blog. 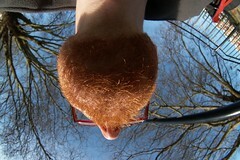 This entry was posted in General and tagged beard, ginger, me, poll, t-shirt, twitter on February 10, 2009 by Alex.